The Sudanese artist is one of the most significant figures in African and Arab Modernism. Exhibition at Tate Modern and essay by Salah M. Hassan. Tate Modern presents the UK’s first major exhibition of Sudanese artist Ibrahim El-Salahi. Bringing together 100 works from across more than five decades of his international career, this retrospective highlights one of the most significant figures in African and Arab Modernism, and reveals his place in the context of a broader, global art history. 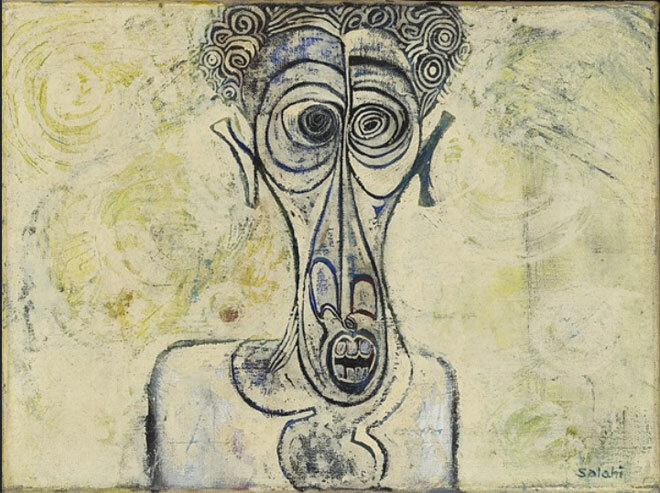 Over more than fifty years of sustained productivity and intellectual engagement, the Sudanese painter Ibrahim El-Salahi has been one of the most prominent figures of African modernism. Through both his extraordinary legacy as a writer and critic and the remarkable breadth of his artwork, in which he has deeply explored all kinds of painterly strategies, he has made foundational contributions to the modernist movement in African visual arts. Yet to understand those contributions requires a rigorous effort to transcend traditional Eurocentric dichotomies rampant in art historical discourse, dividing West and non-West and giving primacy to one and derivative status to the other. El-Salahi’s work must be located within local, national, and transnational spaces in ways that would unravel the fallacies inherent in binary articulations of modernity. This approach will open up an interpretive and critical space in which to resituate African modernity and modernism’s inscriptions in local and global pasts, presents, and futures. Goldwin Smith Professor and Director of the Institute for Comparative Modernities (ICM), and Professor of African and African Diaspora Art History and Visual Culture in Africana Studies, and the Department of History of Art and Visual Studies, Cornell University. © Essay, published in the catalogue: Salah M. Hassan. The exhibition at Tate Modern traces the artist’s personal journey, beginning in Sudan in the 1950s where he originally trained and practiced as an art teacher, as well as his time at the Slade School of Fine Art in London. After this period of self-discovery, El-Salahi returned to his homeland and continued his pioneering integration of traditional African, Arab and Islamic visual sources with European art movements. This cross-pollination of cultures and traditions will be exemplified by such works as Reborn Sounds of Childhood Dreams 1 1961-65, a large-scale oil painting recently acquired by Tate. Events in the artist’s own life, as well as wider political history, are reflected in his work from the 1970s and 80s. While employed as the Undersecretary at the Sudanese Ministry of Culture and Information, El-Salahi was wrongfully imprisoned by the government. The art he made as a result of this incarceration was often stark and sombre, reflecting the trauma of isolation. This phase would culminate in years of self-imposed exile and expatriation in Qatar and the UK, where he created such works as The Inevitable 1984-1985, a monumental and chaotic response to the continued turmoil and civil war taking place in Sudan. The exhibition also showcases the gloriously colourful works that El-Salahi has produced since the 1990s, after his return to England. These include his Tree Series, inspired by the Haraz tree that grows on the banks of the Nile, and One day I Happened to See a Ruler 2008, a major three-panel painting commissioned by the Museum for African Art in New York. These recent works reflect his joy for life, his deep spiritual faith, and a profound recognition of his place in the world. Ibrahim El-Salahi was born in Omdurman, Sudan in 1930 and now lives and works in Oxford, England. His work has been shown at such venues as PS1, New York; Mathaf: Arab Museum of Modern Art, Doha; and Haus der Kunst, Munich. He is represented in numerous private and public collections including the MoMA, New York; New National Gallery, Berlin; and Tate, London. He received the Rockefeller Foundation Fellowship; the Order of Knowledge, Arts and Letters, Sudan; and the Honorary Award, Prince Claus Fund for Culture and Development. Ibrahim El-Salahi: A Visionary Modernist is organised by the Museum for African Art, New York, in association with Tate Modern. It is curated by Salah M Hassan, Goldwin Smith Professor, Cornell University. The presentation at Tate Modern is curated in collaboration with Elvira Dyangani Ose, Curator, International Art, Supported by Guaranty Trust Bank Plc, with Shoair Mavlian, Assistant Curator, Tate Modern. The exhibition first opened at the Sharjah Art Museum in May 2012 and travelled to the Katara Cultural Village Foundation, Doha in October 2012. An illustrated catalogue accompanies the exhibition, edited by Salah M Hassan with contributions by Sarah Adams, Ulli Beier, Iftikhar Dadi, Hassan Musa and Chika Okeke-Agulu, and special texts by El-Salahi. Organised by the Museum for African Art, New York, in association with Tate Modern. Curated by Salah M Hassan, Goldwin Smith Professor, Cornell University. The presentation at Tate Modern is curated in collaboration with Elvira Dyangani Ose, Curator, with Shoair Mavlian, Assistant Curator. Sharjah’s Africa Hall to Reopen on 25 September 2018, for the activities of the newly-established Africa Institute.